Take a halt from your daily schedule and spend some cherry time at Neeleshwar Hermitage, Kasaragod. 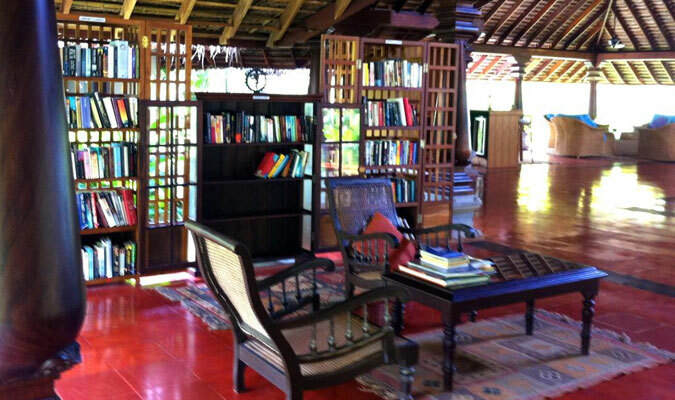 The resort is one among those ideal places where you can sit, relax and enjoy glorious isolation. Blessed with scenic charm, the resort is amazingly designed and arranged according to architectural principles of Kerala Vastu. One can say that the resort showcases a mélange of modern comforts and nature connectivity. Impeccable scenery, graceful interiors and exteriors, spacious accommodation and finest services what else a guest craves for? Neeleshwar Hermitage is listed among the finest accommodation, settled in Northern Kerala away from the hustle-bustle of city life. Neeleshwar Hermitage boasts of total 18 cottages which are exquisitely designed keeping in mind the privacy and individuality of visitors. All the cottages are surrounded by coconut plantations. There is also vast stretch of pristine beach where leisure lovers can laze around. Apart from luxury quotient, the resort has also taken good care in dining section for its customers. Mouth-watering cuisines are served according to the preference of each guest. The staff here is quick and polite. Rejuvenate your mind, body and soul with effective Ayurveda and spa. The therapeutic treatments are practiced in traditional way and given under the team of doctors and experts. Neeleshwar Hermitage, Kasaragod offers 18 beautifully designed cottages which are surrounded by lush greenery, striking banana trees, hibiscus flowers and coconut farms. The cottages are denoted with different names and themes such as Ananda (bliss), Viveka (discemment), Santosh (contentment), Prema (love), Bhakti (devotion), Sama (equanimity), Virya (strength), Moksha (freedom), Shanti (peace), Sukha (happiness), Gyana (insight), Karuna (compassion), Dana (generosity), Bhavana (refinement), Shakti (energy), Ayur (long life), Sneha (affection) and Maitri (friendliness). All the rooms have attractive garden views and awe-inspiring sea views. Guests can choose any of the cottages according to their own comfort. Savor delectable dishes at fine dining restaurant at Neeleshear Hermitage. The restaurant here marks a blend of aesthetic and serene ambience. Separate dining is also arranged on special occasions like Valentine’s Day. Special menu is planned for couples, in-addition to a number of surprises. Annapurna is a dining section where you can relish vegetarian cuisines. The restaurant is associated with Goddess of nourishment. The food served here is both delicious and nutritious. Meenakshi is another dining space that is dedicated to a local Goddess. Here you can enjoy freshly caught and cooked fishes and some light snacks. Make your stay more enjoyable at Annapurna bar and Varuna bar where guests can have special variety of Indian wines and beers.